100architects is a shanghai-based firm founded in 2013 that offers design consultancy services for urban attractors, creating architectural objects that attract users and customers, promoting brands and products. 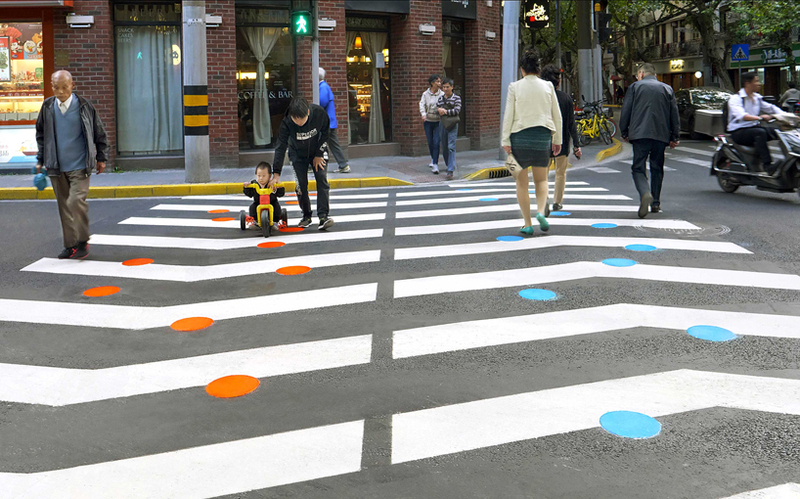 they focus on the exploration of the thin boundaries between public leisure and urban marketing. 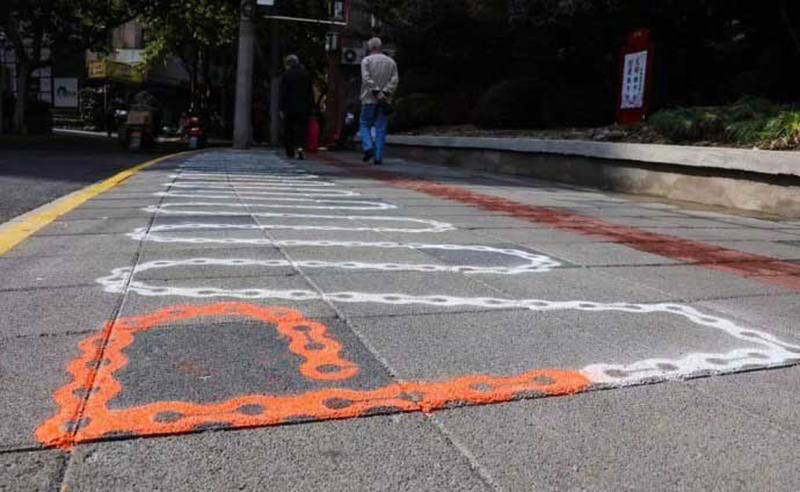 the chain effect is a public space intervention within the framework of shanghai’s urban design festival hosted in 2017, and powered by MINI china through its urban matters platform, which curates and creates design solutions that tackle urban challenges confronting china’s creative class. the ‘modern urban issue’ tackled by the collaborative duet anomaly + 100architects was to improve the pedestrian circulation in old neighborhoods of the city, where sidewalks are narrow and usually massively occupied by bicycles and scooters parked on them, and where zebra crossings are congested with people. 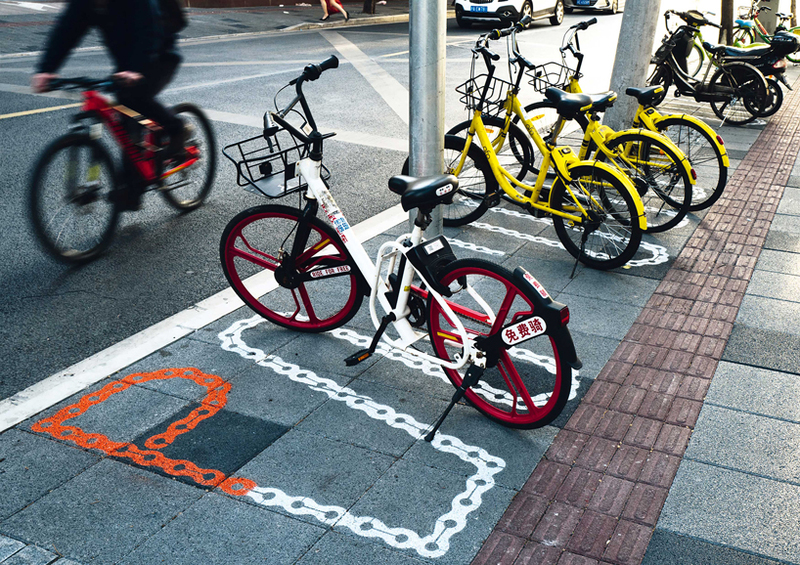 the first issue tackled was the bicycle parking congestion due to the proliferation of bicycles from the booming bike-sharing companies, which has created a new problem in the narrow sidewalks of the city, hindering the circulation of pedestrians. 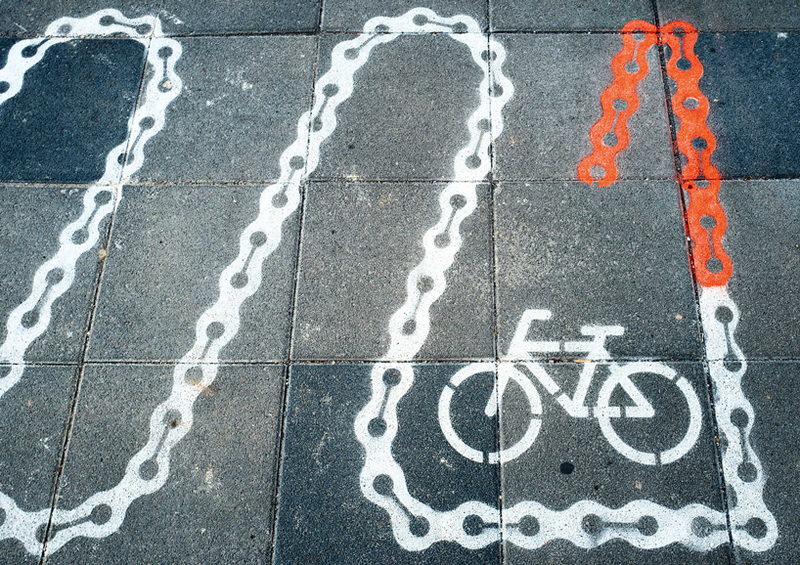 the proposal was not only intended to organize and improve the way these bikes are parked on the streets, but also raise awareness and educate the users on civic behavior regarding the public use of these shared bikes. 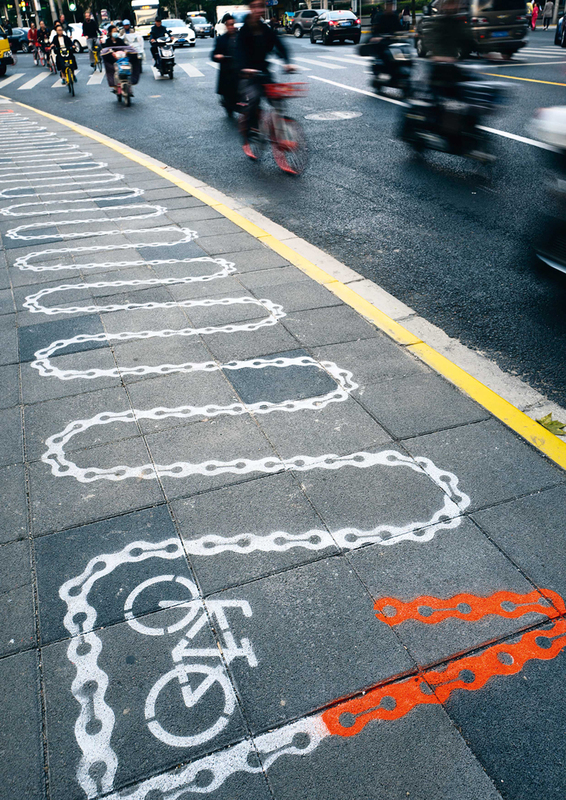 inspired by the chain of a bicycle, the architects came up with a simple yet creative graphic that would indicate for the users the positions to park the bikes and also suggest in which angle they should be parked, optimizing the accommodation of more bikes in certain areas and freeing up to 0,5 meters of sidewalk for a more comfortable pedestrian circulation. the second issue solved was the motorbike parking congestion due to a rising proliferation of food and online shopping delivery companies. 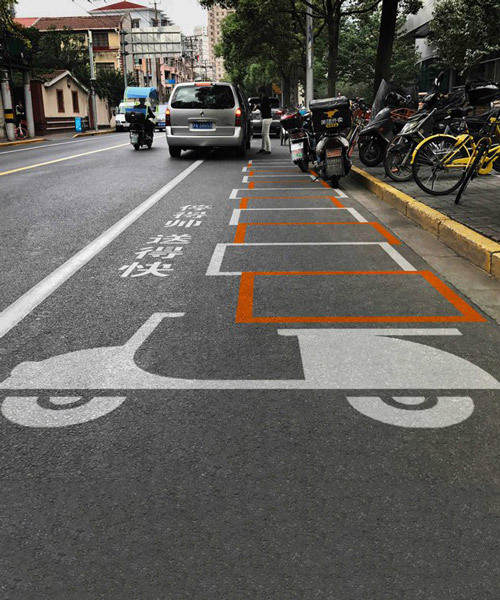 for this, another simple graphic was designed, inspired by the commonly yet unbelievably packed delivery motorbike drivers usually spotted in the streets of shanghai. 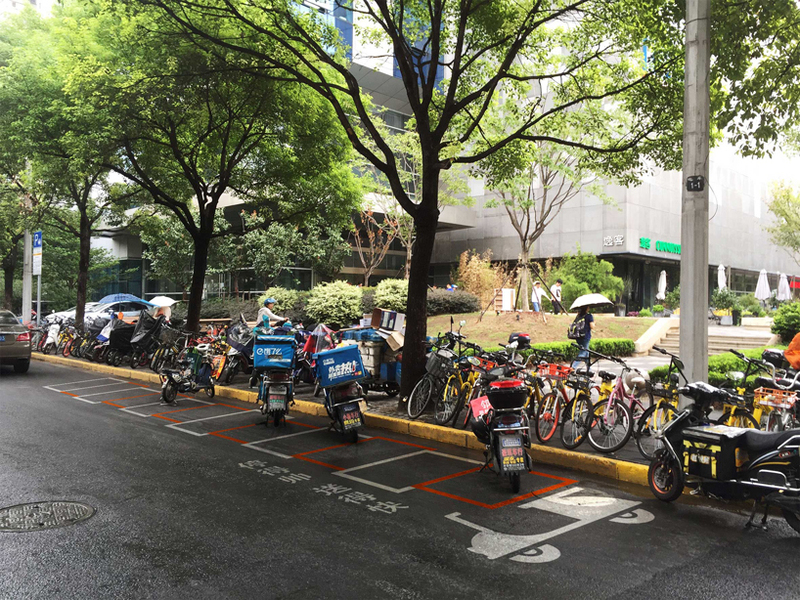 the stacked boxes have become the parking slots for the delivery drivers to park their motorbikes in a specific location and in an organized manner. the third and last issue was the overcrowded zebra crossings in narrow streets, which in peak rush hours are very difficult to cross without bumping into other people crossing in the opposite direction. 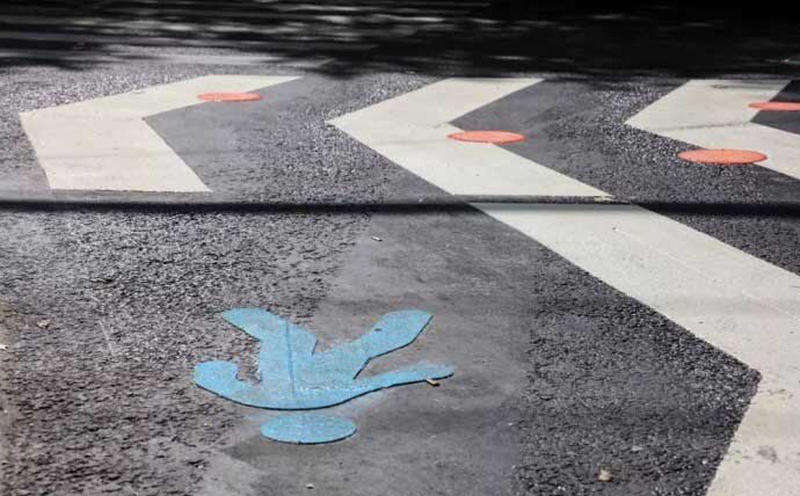 to help organize the pedestrian circulation over those zebra crossings, the team came up with a very simple yet extremely effective modification of the crossing’s white lines themselves, from straight to zig-zag lines, which created a pointing arrow shape, giving pedestrians a directional hint, splitting the circulation in two directions in order to avoid bumping into other people. 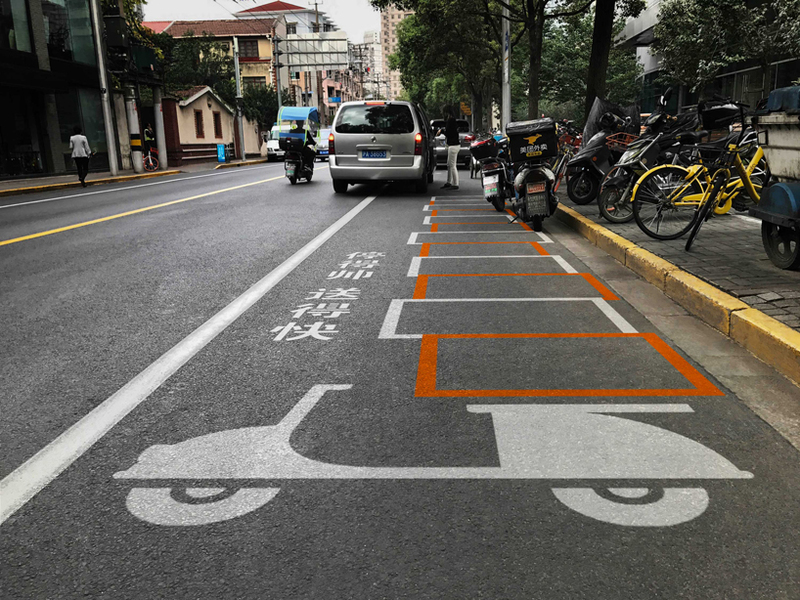 these simple yet smart designs were awarded red dot design award 2018 in the category of environmental graphics.